Yes, I still blog in case all of you were wondering. I still cook too! This week I felt like I was on a roll with work only to reach this weekend and feel like it deflated to disappointment. Such is the the roller coaster but it is a challenge to think I haven’t lost some time somewhere underneath the car seat. The bright side is that I had time tonight to pull together a rich dinner and even blog about it. The other night at my parents’ I caught a food challenge show (which one, I do not know) and group of contestants pulled together crab risotto which after watching, I felt like I could do a better job. Ha! Sometimes I have such confidence. So since I was feeling crabby this evening it was a perfect excuse for a divine summer dinner paired with a bottle of Chardonnay. If I was in a better mood (and less hungry; I am known as the Hulk at home), I would have attempted to make my own crab stock with the shells and for that matter cooked my own crab but hey, I wasn’t in a better mood. Whole Foods had dungeons crab legs which I nabbed about a pound of for the two of us as well as frozen fish stock that I doctored up with some sea salt and thyme. ~ Whole Foods frozen fish stock (put in a pot with sea salt and thyme until it defrosts and simmers. In a heavy skillet or enameled oven (without the lid), heat olive oil over medium, add butter, onion, and garlic, to sweat for 2-4 minutes until soft but not browning. Add the rice, stirring to briefly toast before adding stock by the ladle. Stir frequently and continuously to make sure rice evenly cooks in the liquid, adding liquid, whether it be stock or wine when the pan becomes dry until the rice is cooked al dente. Between the first and second ladle full, add the leeks, thyme, salt & pepper, and cayenne. Don’t let up with the stirring. When the rice is good and tender, add the lemon juice and stir well to incorporate. 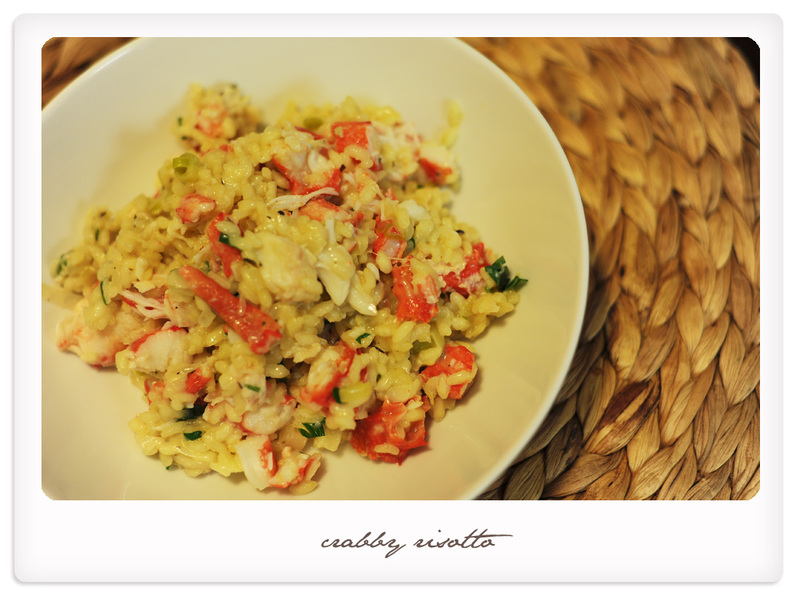 Finish up by adding cream and cheese followed by the crab meat and chopped parsley. 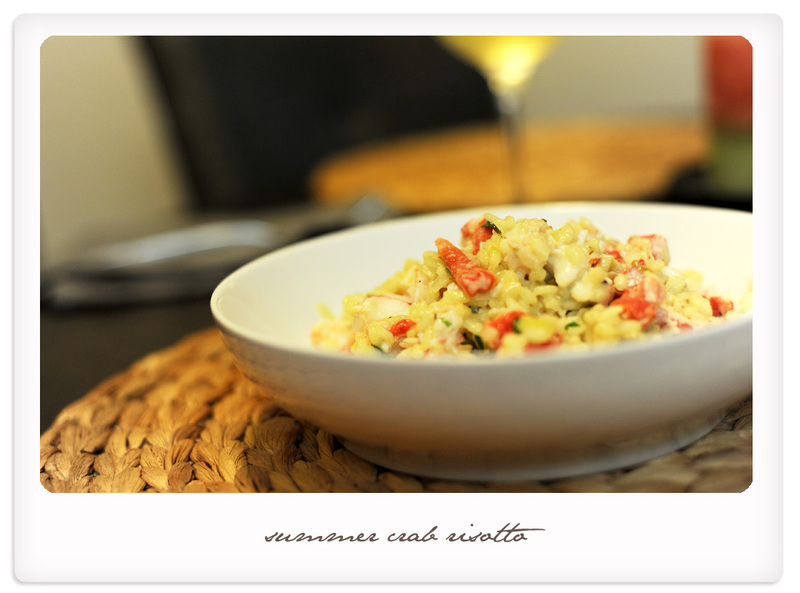 Serve immediately with the remaining chilled Chardonnay. Needless to say, I cheered up. Bon Appétit!